Top » Commercial Dehumidifiers » How do Commercial Dehumidifiers Help my Business? A commercial dehumidifier can be essential in many commercial settings. Owning an air conditioner may provide you with ample cool air throughout the commercial space, but it may not be able to remove the amount of moisture that is necessary in some commercial applications to control the humidity. A dehumidifier’s function is quite simple: remove the moisture out of the air to keep your space clean, healthy and above all comfortable. There are many beneficial reasons why many businesses should own a commercial dehumidifier; the most important benefit is that having a dehumidifier available could allow you the ability to provide a better product for your customers. One of the most important functions of owning a dehumidifier is to remove the moisture that causes mold and mildew growth. In a very humid environment, mold and mildew is almost certain to begin growing. And the problem with mold and mildew is it will grow like wild-fire! The worst part with mold and mildew is if your employees have allergies it would definitely not be a good environment to be in. Not only is mold and mildew hard to discover, they also produce musty odors and smells that will not dissipate until removed. That could be a costly and time-consuming process in itself! Owning a commercial dehumidifier is beneficial to keeping your air clean, fresh and most importantly comfortable. A common occurrence with humidity in a commercial setting is rust to tools and appliances used to do daily jobs. Any objects made of metal being exposed to humidity over time will begin to rust and degrade. 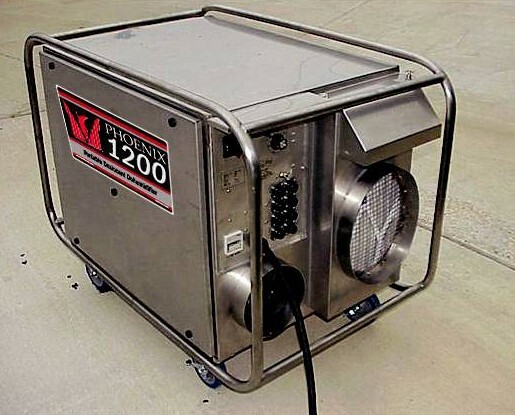 A commercial dehumidifier is essential in keeping your appliances in top condition. In a commercial setting humidity could affect the way things are packaged, painted, manufactured, or even stored. In many of these scenarios a commercial dehumidifier would be beneficial in controlling the humidity so you can get your products to the customer faster and with less disruption to the flow of your business. Owning wooden furniture could potentially be damaged and cracked in a very humid environment. Owning a commercial dehumidifier helps prevent this. Even your flooring could potentially expand and crack and that would be costly to replace. Many times commercial dehumidifiers are also used in the production and manufacture of wood furniture and other wood items. If you hadn’t realized by now, many businesses would benefit from the use of a commercial dehumidifier. Whether you produce chocolate, wood furniture, dog food or anything in between there is a unit that can solve your humidity problems. The best part is there are many available options at a wide variety of prices for commercial use. If you want to create an enjoyable and comfortable work environment and help increase production, look at what a commercial dehumidifier can provide for you. This article was published on Saturday 01 June, 2013.